At the September 15 antiwar march pregame | Jon Katz, P.C. 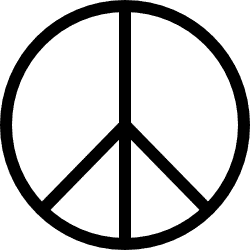 The peace symbol went far beyond hippies. Gerald Holtom designed the symbol in 1958, and the Campaign for Nuclear Disarmament adopted the symbol for its logo. On September 10 and August 22, I blogged about governmental criminal and civil efforts to curb postering efforts by people promoting the September 15 antiwar march in Washington. I took the opportunity to attend, with my son, the antiwar march preliminary activities at Lafayette Park, across from the White House. My eighteen month-old child was going to fall into nap time had I joined the noontime march, so I missed the march portion of the activities. The Iraq War and George Bush II are highly unpopular in the United States, and the mix of demonstrators reflected that. The crowd covered all generations, including diehard peace demonstrators, mainstream-looking students, and Iraq war veterans against the war. Everyone looked peaceful, despite their passions against the war and against Bush. Most of the picketing posters opposed the Iraq war. Other picketing posters urged the impeachment of Bush and Cheney. Some posters promoted Palestinians’ plight. All present were united against the Iraq war. The National Lawyers Guild is frequently invited to send legal observers to such so-called progressive events as this one, and I saw numerous Guild legal observers with their trademark fluorescent green caps. All seemed tame during the 10:30-11:30 a.m. period I was there. A few dozen demonstrators got arrested after climbing a barrier fence near the Capitol building. In the afternoon of the antiwar demonstration., one of my out-of-town relatives called me from the Iwo Jima memorial in Arlington, Virginia, gushing over how positively emotional was the reception of him and his fellow World War II veterans who were in town to visit the World War II memorial. I expected his call, but when he kept dwelling over his WWII remembrance activities, I decided to put it in more perspective by telling him I had attended the morning’s anti-Iraq war activities. He did not seem to understand that I told him this to make the point that we must remain ever-vigilant of the use and abuse of military might for the wrong reasons. Instead, he started telling me his ground route did not take him within sight of any demonstration. The demonstration happened, and I was there. Jon Katz.